The morning's retaliation. I feel it was well played, Greg on the other hand feels that it was MUCH much to obvious. Yesterday morning, post the last ETA, we wandered into the kitchen, and discovered Erik’s initial brand of retaliation. 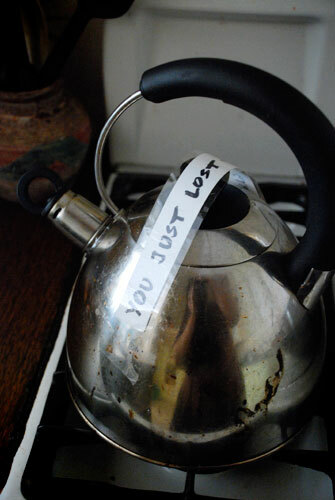 He’d been impressed with Greg’s plot of laptop loss, and thought kettle loss was the logical next step. Greg’s figured it was MUCH MUCH too obvious a response and so has a slyer one in stock for Erik. The longer it takes for it to hit him, the sweeter – OH so sweeter – it will be.